During the 18th century every regiment carried two colours or flags that aided recognition in the field and also acted as rallying points during battle. In the French army of the period, each regiment had a colonel’s colour and also a regimental colour. 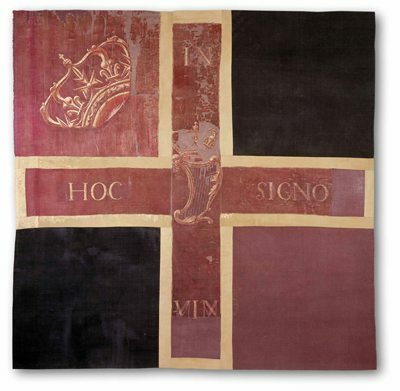 The Dillon Colour on display in the Soldiers and Chiefs exhibition of the National Museum of Ireland is an extremely rare example of a regimental colour that has survived from the 18th century. In its design, it does not immediately strike the visitor as being particularly Irish-looking. Yet the iconography of the colour is interesting and conveys some very deliberate signals. It incorporates the flag of St George and also crown symbols. These may initially seem to be English symbols yet the crown is that of the Stuart dynasty and conveys the point that the Irish regiments were in favour of returning the Stuart monarchs to rule over England, Scotland, Wales and, of course, Ireland. The motto on the colour – “In Hoc Singo Vinces” translates as “In this sign you will conquer”. It is a reference to the vision that the Christian emperor Constantine is reported to have had before his victory at Milvian Bridge in 312AD. In invoking the support of God through this ancient motto, the Irish regiments indicated their support for the Roman Catholic Church, which they also wanted to see reinstated in Ireland. In its political and religious overtones, therefore, the colour reflects the aspirations of the members of the Irish regiments who were living in exile on the continent and it is interesting to note that similar designs were also adopted for the regimental colours of the regiments of Clare, Bulkeley, Berwick and Lally. There were regiments classed as the “Regiment of Dillon” in the French army in the early 17th century. This colour, however, belonged to the Wild Geese regiment that existed from 1691 to 1791. Originally part of the army of the exiled James II, it later transferred to the French service and served in every major war of the 18th century including the War of the Spanish Succession (1701-14), the War of the Austrian Succession (1740-8) and the Seven Years War (1756-63). A contingent of the regiment was sent to America during the American Revolutionary War (1775-83). Command of the regiment was held by members of the Dillon family who acted as colonel-proprietors. The Chevalier Jacques Dillon was killed at the head of the regiment at Fontenoy (1745) while his successor Comte Edouard Dillon was killed at Laffeldt (1747). According to tradition, this colour was carried at Fontenoy; a French victory in which the Irish regiments played a major part. Interestingly, after the French Revolution the original regiment was renamed as the 87th Régiment d’Infanterie but later attempts were made by both the French and British governments to raise units bearing the traditional title of Regiment of Dillon. The traditions of the regiment were maintained by various units of the French army up to 1940. Having been held by the Dillon family this regimental colour was given to the Military History Society of Ireland who then held it in safekeeping. Now restored, it is perhaps proper that it is on public display as it is an icon of an ancient Irish military tradition that has vanished – alongside the both the Stuart and Bourbon monarchies that these exiled Irish soldiers supported. (Dr. David Murphy is author of ‘The Irish Brigades’, a history, commissioned by the Military Heritage of Ireland Trust, of Irish military service from 1685 to 2006 both at home and across the world.